How Do You Feel When You’re Speaking English? 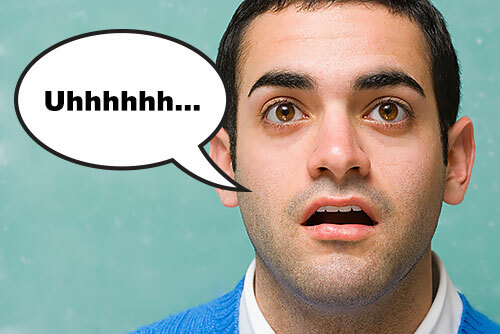 Does speaking English put you into a panic? When you want to say something in English, do you feel like this? You don’t remember the words you studied. You try to open your mouth, but no English words come out. Students often say they forget everything because they get so nervous when they’re speaking English. Most people are afraid of making mistakes or afraid that no one will understand them. It’s this fear that stops some people from speaking at all. Your goal for speaking English should be to communicate your message, not to say a perfect sentence. Don’t be afraid of mistakes! A mistake is not always going stop people from understanding you. 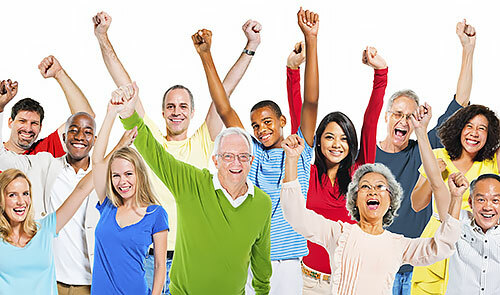 You will be overjoyed when you realize other people understand you when you’re speaking English even with mistakes. Every time you are able to communicate with someone in English, you will feel better about your English speaking skills. You will improve with practice, so it’s important to keep trying. Listen: The more English you hear, the easier it will be for you to copy what you hear. Practice: The more you speak, the more comfortable you will feel about speaking. Start with easy things. Ask questions at a store. Ask where you can find something, even if you already know. Say hello to the bus driver. Just open your mouth and talk whenever you can. Stop worrying about making mistakes: We all make mistakes. Your message is most important. If the other person understands you, it’s not important how many mistakes you make. Practicing and improving your English skills at USA Learns will give you the courage and confidence you need when you are speaking English to other people. To speak confidently you need knowledge of vocabulary, sentence structure, pronunciation, and finally listening comprehension to understand the other person so you can reply. At USA Learns you will be practicing all of this in our activities while you are practicing speaking English. The first step to more confident speaking skills is lots of listening. You need to get the sound of English conversation in your head. 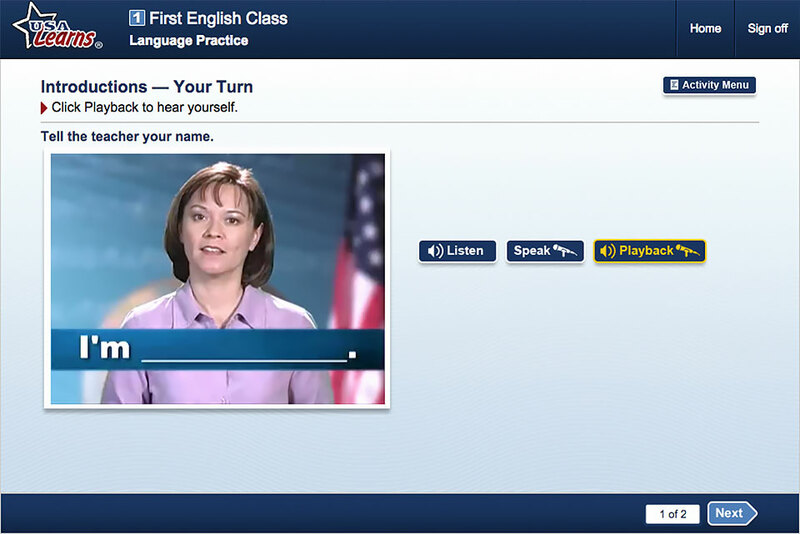 In USA Learns, every unit has many short video episodes. 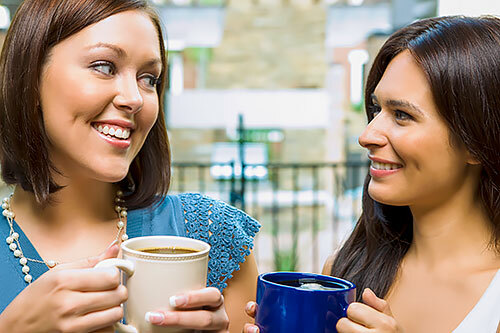 You will hear different people speaking English in everyday conversations, exactly the kind of language you need to improve your spoken English. 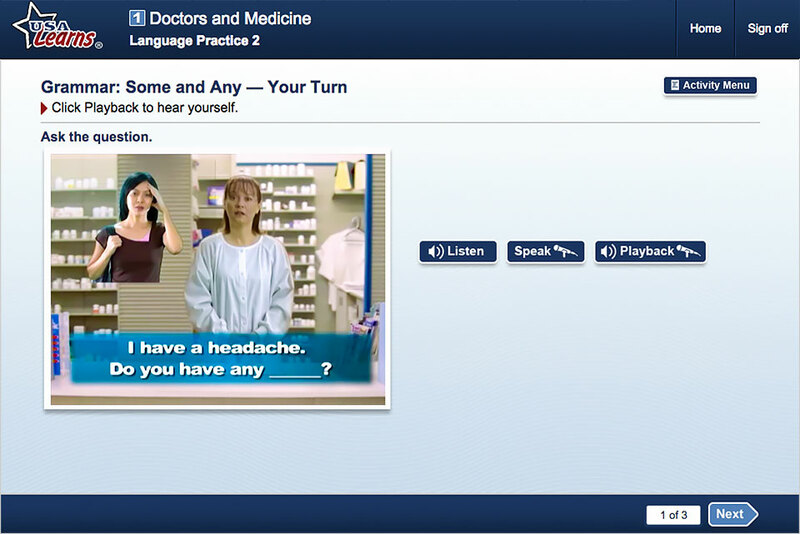 During the unit, you will study the vocabulary and grammar of the language in the videos. You will begin your practice of speaking English with the key vocabulary words in each unit. Besides learning the meaning, pronunciation, and spelling of the 12 to 20 key words in each unit, you will also practice pronouncing the words by listening, speaking into the microphone, and then comparing your pronunciation with the native speaker's. 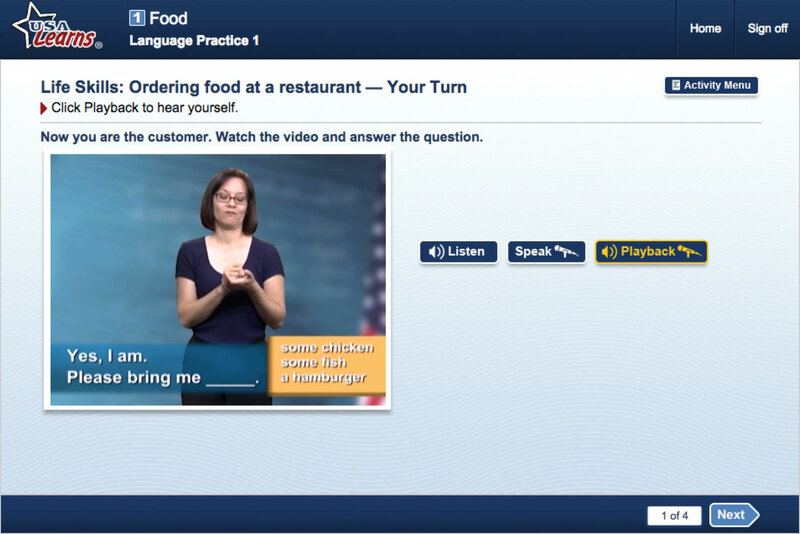 You will also practice saying some of the important sentences in the conversations from the videos. Always listen more than once. Listen to the pronunciation of the words and the rhythm of the sentence. When you are ready to try to say the sentence, click the Speak button and speak into your microphone. When you click Playback you will hear the native speaker again and your own voice. Do you like the way you sound? If not, repeat. You can click Speak and make a new recording to improve your English speaking skills as often as you want. So far you have practiced speaking English by repeating. But you need practice in responding when someone says something or asks you something. In the 1st English Course, your friendly teacher, Ms. Marquez, will practice speaking English with you. She speaks directly to YOU in the Your Turn activities. She wants you to feel comfortable and speak to her with confidence. She starts with the basics and asks you to introduce yourself and to tell her when your birthday is. Speaking is an important part of USA Learns. Even in the grammar lesson you may have to speak. In this activity, Ms. Marquez plays a pharmacist and asks you what you need. She wants you to practice the grammar of using ‘some’ and ‘any’ in questions and answers. Where else can you practice speaking English AND grammar in a real-world situation, with a person talking to you? In another activity you will practice speaking English in a restaurant. Ms. Marquez plays the waitress and asks you for your order. You don’t have to be shy with Ms. Marquez. She is a very patient teacher! Practicing by speaking out loud or into the microphone is very important. It’s important for you to say the words out loud when you are relaxed and not afraid of what other people will think. It’s just you and your USA Learns friends so you can speak freely. Do not skip these lessons if you really want to improve your speaking skills. Even if you don’t have a microphone or the software, say the words out loud. Make your mouth and tongue form the words. We say ‘practice makes perfect.’ That may not be completely true for speaking. Everybody makes mistakes, and that’s OK. But practice will build confidence and that’s what you need if you want to be successful at speaking English. REGISTER NOW to improve your English speaking with USA Learns!